I am having some challenges with my second gen Scarlett 2i4 and Loopy HD. I can get GarageBand working properly, but am having no luck with input in Loopy HD. I see the L, L&R and R on the microphone tab, but I cannot tell what input I am selecting because the boxes around the letters are kinda grayed out. The interface is checked in the settings menu. I am using a powered usb hub and an Apple CCK for connections into an ipad 2. The hub is connected to the CCK kit properly. Last night, I was able to get input recognized, but then could not hear it play back. Then the battery ran out on the ipad. after a charge, I could not get it to work again. 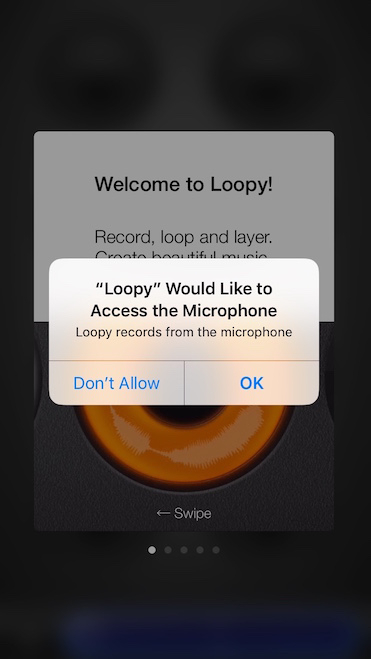 Does the microphone in the system preferences for Loopy need to be checked? Do I need to change a software setting on the interface? I know that there must be something so simple that I am not seeing. Any suggestions would be welcome. I am away from the ipad, so I do not remember the OS. or the version of Loopy HD. 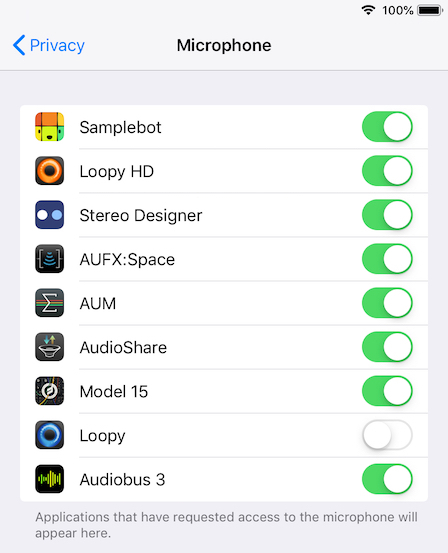 Does the microphone in the system preferences for Loopy need to be checked? Yes, absolutely - if it's not, that'll be why it's not working. Your answer solved my issues. Amazing work in this program. You must select "OK" for the app to work properly. If by chance you choose "don't allow" then you will have to go into iOS Settings > Privacy > Microphone to see a list of apps that have requested microphone access. Toggle the switch to "on" so that your music apps can access the audio system and work properly. I did see this and thought it would only lead to howling feedback.